These systems are used for transfer of water from underground to overhead tanks in residential, commercial and industrial complexes. Sometimes in absence of the overhead tanks, Diaphragm pressure tanks accompanied by pressure switches are used which ensures constant force of water at each and every outlet. 3. Control Panel with Level sensors to avoid manual intervention. They are fitted with all possible protections to ensure trouble-free operation of the pump for prolonged periods of time. 4. Diaphragm tank, pressure switches, pressure gauge and different type of valves for a pressurised system. Normally these systems have 1 or 2 working and 1 standby pump. 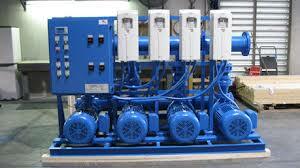 When there are 2 working pumps the first pump starts at a higher pressure. Even then if the pressure keeps dropping then the second pump starts and they continue running till the system pressure reaches the cut-off level and both pumps are tripped off. This helps In conserving energy. The control panel is also designed such that all 3 pumps (2w+1s) start sequentially in a cascade operation so that none of them get jammed due to lying idle for a long time.